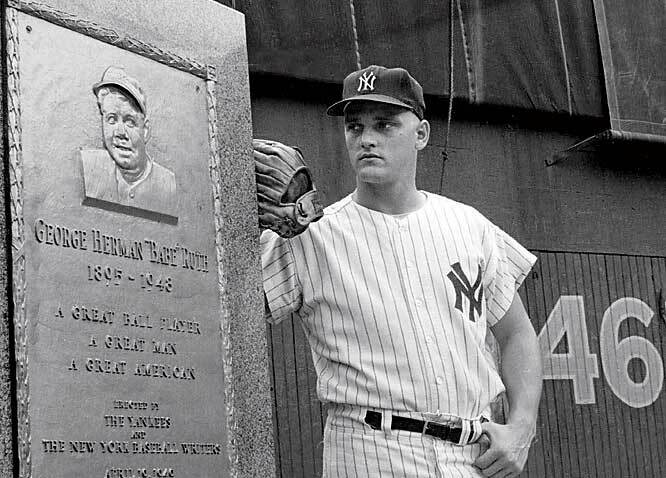 On this day 52 years ago, Roger Maris began his assault on Babe Ruth‘s hallowed home run record. It took him until the eleventh game of the season, but Maris finally connected on a long ball in the 5th inning off of Detroit’s Paul Foytack. Incredibly, it would be his only home run in the month of April. He would see a surge in May with 11 dingers, but it hardly appeared he would make a run at the Sultan’s mark of 60; but as the temperatures rose with the onset of summer, so did Maris’ totals. After hitting a home run off of Boston’s Billy Muffett on May 31st, he would hit fifteen more by June 22nd, to give him a total of twenty-seven. Another thirteen in July gave him forty and by the time the steamy days of August were over he had fifty-one on his way to a remarkable and controversial finish to the saga. On October 1st, the season’s final day, the lefty turned on a pitch from Boston’s Tracy Stallard and sent #61 streaking into the right field stands. Even in an age of inflated home run totals, sixty-one home runs in a single season remains a stunning feat. It all began on a late-April afternoon at Tiger Stadium. The game itself, aside from Maris’ noteworthy missile, was a memorable one. The Bombers burst out of the gates in the first, scoring five runs on a Hector Lopez single, a Chico Fernandez error, a sacrifice fly by Elston Howard and a single by Whitey Ford. In the 2nd, Tony Kubek pushed the lead to 6-0 on a home run to right field, but the Tigers bit back, scoring four in the 2nd off of Ford to close to within 6-4. Bobby Richardson tacked on another Yankee run in the 3rd on an RBI groundout, but Detroit scored in the 4th to stay within striking distance. Each squad plated a run in the 5th, leaving the Yankees up 8-6 when the fireworks started. Ford loaded the bases with 1 out in the 7th after two singles and a walk, then was chased from the game after yielding a game-tying single to Norm Cash. Bill Stafford relived the Chairman, only to give up three more runs as the Tigers jumped out to a stunning 11-8 lead. One inning later the Yanks got Ford off the hook for the loss when Richardson scored on a wild pitch and Mickey Mantle blasted a two-run shot to right-center. The game remained deadlocked at 11-11 as the game moved to extra innings. In the 10th, with 1 out and Lopez on first, the Mick dug in again and sent Hank Aguirre‘s pitch to deep left-center to provide the final margin in a thrilling 13-11 win. Luis Arroyo earned the win with two innings of no-hit ball.